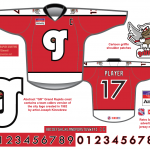 The Grand Rapids Griffins have been running their annual jersey design contest this month over at Uni-Watch. 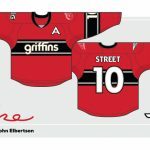 Over the last week, 119 entrants were voted on in four polls to produce twelve finalists, from which the Griffins staff will select at least one winner. 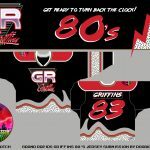 This year there was a twist to the contest, as submissions were required to be in the form of an “80s fauxback” – a design the Griffins might have worn had the team existed a decade earlier. 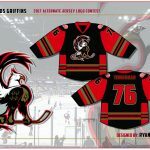 The finalists for the @griffinshockey fauxback jersey design contest are an interesting group. I’d love to hear what the team has to say. Assuming the voting records are still accurate, of course, since nothing official has been announced yet. Unlike previous years, there were specific parameters for this contest. How strictly must they be followed? Will “I think this one looks the coolest” trump “This one is the best fauxback?” What fauxback elements are they looking for? I think it’s pretty easy to pare it down from twelve to four. After that, it depends on exactly what they wanted. Since I’ve done reviews of the contest in previous years and I already mentally pared this year’s finalists down, I figured I’d run through my thoughts on them. Keep in mind that this is an unofficial list of finalists. I went back and checked the voting but it’s possible that votes were cast after the deadline, skewing the results. I’ll start with the ones that I think are easy to eliminate and why. I should note that I’m focusing on flaws because I’m looking at why I think they might not win, not why they’re bad designs. Last year’s winner is probably prohibited from winning again this year but I’m not sure. 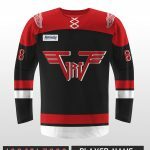 If not, while the GRG-meets-Van Halen logo certainly has an 80s look, it’s not an 80s hockey look, as no team would have worn that logo on the ice. Between the number font and the gold trim, I get an art deco vibe from this. The chest stripes were not an 80s thing and the lowercase wordmark across the chest feels more 70s than 80s, though I admit that much of 80s hockey design began in the 70s. This design is so close to not being cut. The stripes work for me and the logo is good but it’s too complicated for the 80s. There wouldn’t be stitching details, for one. The split number doesn’t feel particularly 80s to me. Another issue is that I see an eagle a lot more than a griffin in that logo. 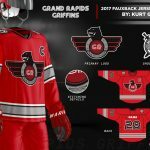 Finally, I don’t get what the swords on the shoulder logos (which probably wouldn’t have been used in the 80s) have to do with Grand Rapids or the Griffins. Too many small issues but it doesn’t stop me from liking it in general. I love this look but the chest stripes to me scream 1920s, not 1980s. I hope it gets worn at some point but it shouldn’t win this contest. I like the direction that this one goes as it’s close to one of my initial logo designs, based on the Edmonton Oilers. It’s just too poorly-rendered for me to consider as a winner. 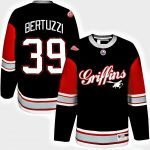 The Griffins reserve the right to edit designs, though, so they theoretically could take this, shrink down the numbers, clean up the logo a little, and run with it. My best guess is that this is trying to emulate the Vancouver Canucks’ V-striped jersey of the 80s but I can’t view it without feeling like a seizure is coming on. It’s just not a good hockey jersey design. Like Zach Grantham’s design, I like this one quite a bit, it just has nothing that says 1980s to me. The wordmark on the chest looks more like the 1950s. The striping says early 2000s. I’m not against the mish-mash of eras in general, I just don’t think it’s right for this contest. Lack of a waist stripe is a very Reebok Edge thing. Is the cartoon logo 80s? I don’t know. This feels unfinished, much like Dylan Gray’s. There’s a difference between 80s simplicity and unfinished. Another that I kind of like. It’s too complicated even as a modern alternate, in my opinion, and it’s not a fauxback in any way. This leaves three (as opposed to the four that I tweeted) that I think are real competitors but each has flaws as well. With the above, I feel like the flaws are obvious enough to eliminate them from contention. I could be wrong about that, obviously. With the three remaining, I think it comes down more to what the team is looking for. This is pretty. Traditional striping, simplified colors. 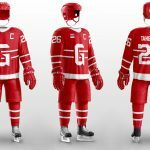 I love the use of the wing from the Red Wings’ winged wheel as the Griffins’ wing, which is a design choice I’ve made before. That said, it doesn’t feel 80s to me. It feels like a 50s design that could have been worn into the 80s, though, and it’s rendered well enough that it slides into my final three. One big knock – which is a flaw of the contest so the Griffins will probably ignore it – is that I can’t see that gold being used in the 1980s. It would have been a bright yellow. My own design of course makes my top three because I’m judging these with the same mindset with which I designed this one. I wrote about the design process on my personal blog. The logo feels too 90s to me, which I think is because of being forced to use red and black instead of blue and red. I came up with a better version after voting already started but that’s not what the Griffins will be looking at. Striping is based on the New Jersey Devils and drop-shadowed numbers were all over the 80s. That logo might be a weak point, though. I honestly don’t know what to think of this one. Initial-based logos were big in the 80s – Calgary Flames, New Jersey Devils, Hartford Whalers. But the lower-case letters feel too 70s to me. The number font doesn’t feel 80s at all. But overall, I love the look of it. Update 8/24/2017, 8:10 AM: With the official finalists announced, it turns out that I failed to account for a surprising disqualification. 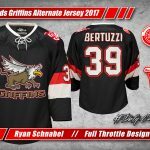 Zach Blackwell was rejected from the contest for modifying a stock griffin image and tacking on the Red Wings’ logo. 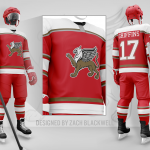 As I mentioned, I like the use of the wing from the Winged Wheel, and I think borrowing from a parent club’s identity is appropriate for the 1980s (remember that until the Red Wings affiliated with the Griffins, their farm teams in Hampton and Glens Falls used the Winged Wheel for decades). That said, the use of clip art as a base is hard to ignore. This means that one of my top three is out. Replacing Blackwell in as a finalist is Roark Boes, so here are my thoughts on that design. 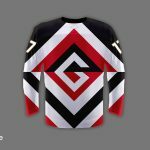 This is another design that uses 80s pop culture elements but not 80s hockey design. 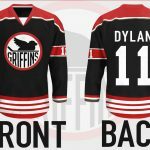 As such, I think it’s easy to eliminate immediately, should the Griffins actually be looking for a true fauxback. The poll below has been updated to account for this change. To me, it comes back to not knowing how the Griffins staff and ownership will judge this. Will they look at a design and analyze the individual elements? Will they go more by feel? Will the fauxback requirement they set forth even matter? I’d love to hear the discussions. 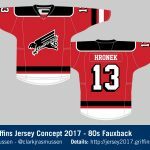 Whose fauxback Griffins jersey concept is your favorite?